Kneeling, from left, are 2018 Georgia state champion debaters Michael Morgan, Gabe Smith, and Harrison Rogers. Standing are Assistant Debate Coach Janey Simmons, Dylan Mikilitus, Ruthie Reeves, CHS Principal David Brooks, LeCurtis Richardson, Hayden Harper, Evan Abbey, Cruz Cuellar, Edward Bohannon, Janice Teal, Jada Thomas, and Head Debate Coach Richard Bracknell. Not pictured are Chase and Pate Duncan. CARROLLTON, GA — State championships provide impressive bragging rights for high schools and remain an important part of a school’s legacy even generations after the titles are earned. The inclusive nature of athletic competitions, in particular, provide a sense of belonging and purpose, boosting a school’s reputation and generating heartfelt pride among its alumni. Academic and artistic competitions also play an important role in a school’s story, yet these accolades are often overshadowed by the roar of a stadium crowd or chants in a high school gym. But Carrollton High School has an enviable collection of top-notch titles in these arenas as well, further demonstrating a tradition of excellence that encompasses a broad spectrum of accomplishment in all disciplines. 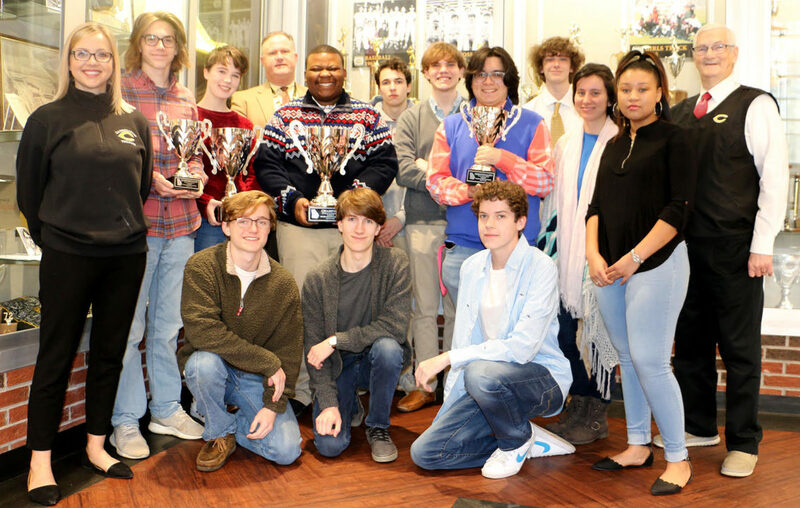 Just this past weekend, Carrollton High School’s renowned debate program captured its 10th state championship, maintaining its impressive place in CHS history as the second-highest number of state titles claimed by any program – academic or athletic – with the exception of the state crown leader, boys track. Senior Ruthie Reeves led the debate team to final victory, preceded by the success of juniors Cruz Cuellar and Gabe Smith who competed in the semi-finals and senior Michael Morgan and junior Dylan Mikilitus in the quarter-finals. Junior LeCurtis Richardson added to the championship with his individual state title win in Dramatic Interpretation. Other team members who contributed were Evan Abbey, Hayden Harper, Janice Teal, Jada Thomas, Edward Bohannon, Chase Duncan, Pate Duncan, and Harrison Rogers, rounding out the state champion team. The 2018 Georgia Forensic Coaches Association State Championship tournament was held in Marietta at Lassiter High School. First and Second Year state contenders pulled off near-top finishes in February. From left are Janey Simmons, assistant debate coach; Patrick Berzsenyi, Jack Cox, Javier Miranda-Lopez, Lyall Penley, and Richard Bracknell, head debate coach. Since 2010 when GFCA took over state debate championships (the Georgia High School Association discontinued its debate competition after 2009), Bracknell said schools do not participate in population classifications like other competitions. Instead, schools have to earn a chance to go to state following a qualifying procedure that involves tournament participation and finishing in the top four in at least one tournament. There were 36 schools competing in this year’s championship tournament, including debate powerhouses Henry W. Grady, Atlanta; and Columbus, Marist, and Starr’s Mill high schools. Bracknell said the future of the debate program continues to look bright. This year’s First and Second Year State Championships, held Feb. 9-10 and hosted by Carrollton High School, resulted in a runner-up finish for both freshman and sophomore groups. DEBATE – The most acclaimed of the academic title programs is the Carrollton High School debate team. Debate has earned the second highest number of CHS state championships – including all sports – surpassed only by boys track. The team has been crowned state champion 10 times – in 1987, 1988, 1989, 1992, 1995, 1996, 1998, 2003, 2010 and 2018. The team was the state runner-up champion seven times – in 1986, 1990, 1991, 2000, 2001, 2002 and 2004. The team also has captured 17 region titles. In 2010, the Georgia High School Association discontinued the debate championships, picked up then by the Georgia Forensic Coaches Association. CHS won state that first year. SPELLING – Though not an official competition category in today’s world, spelling used to be a big deal at the high school level. CHS actually won the state crown in 1963, following region titles in 1951, 1961, 1963, 1968 and 1970. Today, spelling prowess is still an honored virtue at the elementary and middle school levels with Carrollton fourth through eighth graders competing every year and advancing to district competition. This year, the 2018 Carrollton City Schools spelling champ, eighth grader Kyu Alegre, will compete at the state bee later this month, the first time since three-time state qualifier Ali Low last competed in 2006. LITERARY – Literary competitions bring together the arts of performance, essay writing and public speaking. The events are highly competitive and hard to win at the state level. Carrollton earned state championships in 1987 and 2011, and captured the runner-up finish in 1977, 1989, 1992 and 2010. Region championships have been recorded as early as 1933 with a total hovering around the 20-trophy mark. This year, CHS senior Blair Lipham, who placed first in Girls Solo in region competition, will compete at state March 17 at Buford High School. 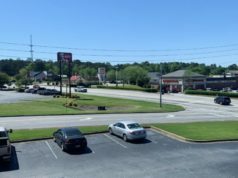 BAND – While Georgia high school bands don’t have an infrastructure to compete statewide, they do participate in marching competitions and concert festivals to be judged for musical excellence. The Carrollton High School Band excels in both areas, upholding almost four decades of straight “superior” ratings, the highest ranking given for musical performance. The band over the years also has earned top honors as the Grand Champion band on many occasions, some seasons sweeping every band competition. And the band now also hosts its own event, Legacy of Champions, a competition for other bands that is quickly becoming recognized as one of the best competitions in the state. VISUAL ARTS – Carrollton High School art students have their own ways of competing in a medium that is that is judged very subjectively. Much like band competitions, visual arts students have the opportunity to register or be invited to showcases where they can earn recognition for their work. Just this school year, two students were invited to submit their work in a Southeast regional exhibition and for a number of years, CHS artists earned the Best in Show award locally at the Kiwanis Juried Art Showcase, then competing among the best in the state.